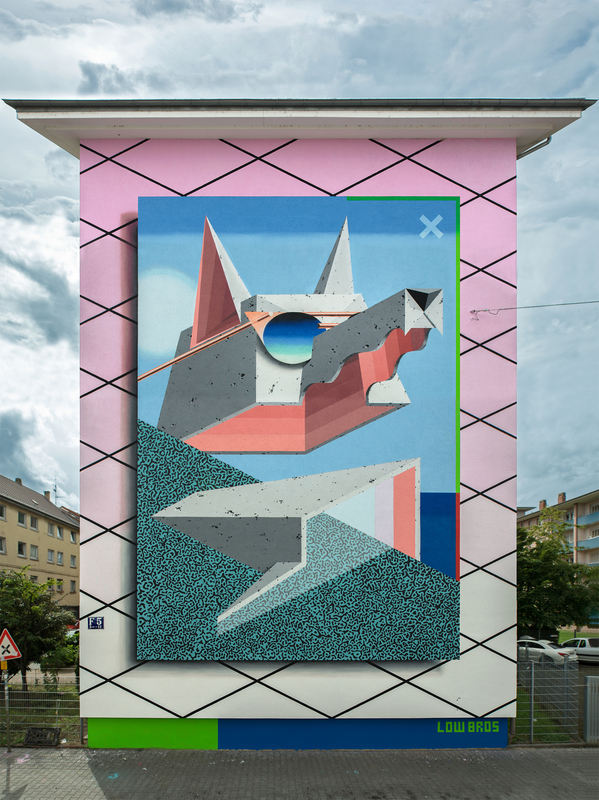 Born in Hamburg, but based in Berlin, Low Bros is an artist duo made up of Christoph and Florin Schmidt –a.k.a. Qbrk and Nerd. These guys know perfectly how to mix the geometrical shapes with the natural essence of things. Influenced by the mass culture, graffiti, skateboarding and hip hop, their unique work stands out either digital or on the streets. Either a bright color palette or three-dimensional executions, they create stylized-animal characters with some human features. Cubic effects, acid colors, flamboyant esthetics, virtual-minded characteristics, they know how to make us believe their pieces could be part of a video game, and we are only visitors in this cool colorful world. But always precise and perfectly detailed, their art is a blink to the future. 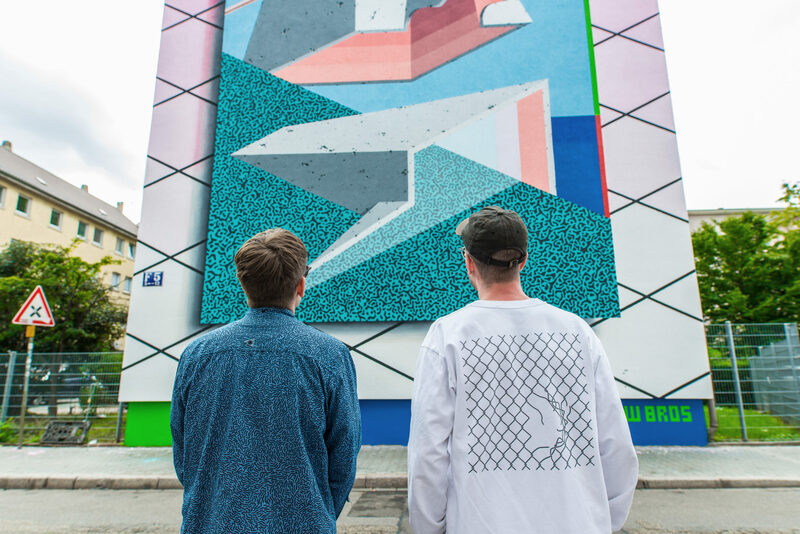 This time, Montana Cans Blog had the chance to talk to the Low Bros and they told us about their recent participation at Stadt Wand Kunst Festival, in which Montana is part of the partners, as well as their future projects and what keeps them art minded, inspired and productive… so read it up and enjoy! Montana Cans: So, now that you guys are at Stadt.Wand.Kunst, what is the idea behind the piece you are painting for the Festival? 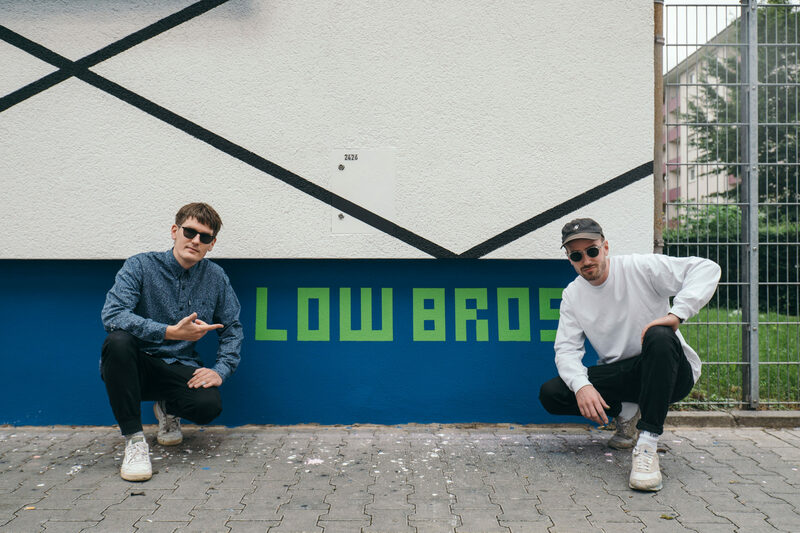 Low Bros: We came to Mannheim with a sketch, but we changed the plan and made a new one. We thought the first one didn’t really fit in the scenery, even though we like murals to stand out from its surroundings. For our second sketch, we liked to integrate the idea of the Quadratestadt—means square city, the center of Mannheim is built like a rectangular grid—and translate it into our visual language, so we put a grid of tiles in the background. The layer on top is our addition to the already given. We like the idea of bringing our own visuals to different parts of the world, rather than integrate too much of what we find on-site. So, we brought something different and we hope to raise the level of tolerance for the new and foreign, which we think is essential to live in an urban environment. Even though, we still like being influenced by the surroundings, if it fits in. When we were in Morocco for example, we had to play with the Islamic geometry and integrate it into our piece. On the top layer, we speak for the younger generation, which constantly creates something new out of it, or on top of the persisting things. It’s like us, we always want to take it further but at the same time to keep the traditions in the corner of our eyes. You see the wolf character in the center of the piece. At the moment, our focus is on wolves as main characters in our paintings. As in our previous ones, we were often changing and growing fauna, the wolves are still the counterpart of human beings and reflect their behavior. Hiding the eyes and their personality with reflecting shades and coated with a stone-like surface, they keep a certain distance and appear more like a projection screen for the generation of the digital age. So, this piece is a part of a bigger series and also give an outlook on our upcoming work. Montana Cans: After so many art projects and festivals, is this one different from the others? Low Bros: One advantage of “Stadt Wand Kunst” is that they can focus on one artist at the time, in contrast to festivals where they invite ten or more artists at once and need to take care about everyone. The close connection to the cultural center “Alte Feuerwache“, this is also a benefit, and they provide the best accommodation you can imagine. We liked their curatorial spectrum. Most of the invited artists are real urban artists, who have their background from painting on the streets. Nowadays is very popular that a studio artist got labeled as street or urban artist just because he/she have painted one big wall. Montana Cans: What is the main thing that keeps you inspired and productive? Low Bros: We were always passion-driven by our work. We talk a lot about ideas ‘till we catch fire and have to realize them. So, it’s us. We push each other. Montana Cans: For you, what is the main characteristic a mural festival or a project has to have, so you are really interested to participate in? Low Bros: You never know. From the distance, there are factors like where is it –a central spot in a big metropolis is still the most interesting thing, because you want as much people as possible to walk by and see your work in the flesh–how is the curation, who is behind this and what’s their intention. The fee became important and it should be for all the artists. We all put a lot of work on it and even if it’s fun for us, we all have to survive, but to be honest—and sadly—money seems to be the measurable value most people can agree on. In the end, you will know after participating, so it’s also good if artists exchange their experiences. And a simple advice—for festival organizers—the artist will do his best work if he only focus on painting. This is exhausting enough, so give him the best possible working conditions. Montana Cans: What does Montana Cans means to you, after all these years? Low Bros: We like how Montana constantly enhanced the quality over the years. At the beginning, we were not that convinced, but now you got one of the best can controls with the GOLD and BLACK. Every brand has their pros and cons, but for us the most important thing is the range of colors. There’s already a huge palette with GOLD and BLACK together, but for us there can still be more colors. We’d actually have some ideas, hahahaha. What we really appreciate, besides that, is their big support for the scene, and to us. Thank you, guys! Montana Cans: What do you like about Heidelberg? When you are there, what do you like to eat? Montana Cans: What is next with the Low Bros? Are you working on something new that you want to share? Low Bros: We just started working on our next solo exhibition, which will be at Mirus Gallery in San Francisco in April next year. This will be the final chapter of a trilogy, together with our two latest shows: “Perfection“ & “Wired”, at Golden Hands Gallery in Hamburg and StolenSpace in London. But first we’re excited to go to Australia, for the first time, to paint a mural for the Sea Walls project in Cairns. Montana Cans: If you could give any advice to your younger “you” like five or ten years ago, what would you like to tell ‘em? Low Bros: Trust yourself rather than other people’s advices, if it comes from making art. If you want to walk an unknown path, you better not listen to those who never went even close to it. Plus, always take your own camera to take photos of your piece!! The documentation of your work is as important as the work itself.